The journal was obviously front and centre, displaying our wonderful cover design by Rachel Morley, encapsulating the feel and ideas of our ‘binary’ theme. (There were also some sneaky 2017 editions from Antithesis’ 30th anniversary out, which are still available online.) 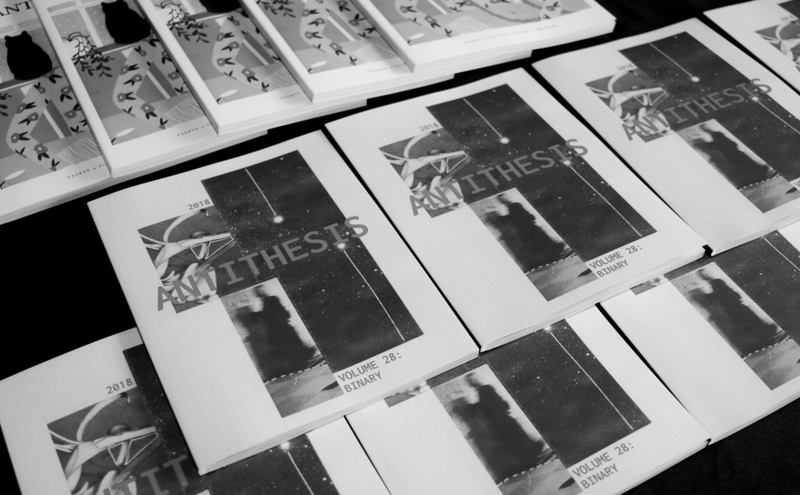 If you missed out, copies of Antithesis 2018 are now available online from Books at Manic. Antithesis issues from 2018 and 2017 – get a copy while you can! After speeches from our Editor in Chief, Sunni Midtskogen, and Managing Editors Sarah Layton and Steph Lightfoot, John Morrison read an excerpt from his essay, ‘Breaking Through the Glass Cathedral’, exploring the merging of two seeming binaries: the Christian Church and LGBTQI+ communities in Melbourne. Academic editor Steph Lightfoot and John Morrison at the launch party. Thank you to everyone who made it to the launch – a lot of effort goes into the print journal every year, and being able to celebrate its publication with friends, family and readers is such a lovely end to the process. The 2018 Antithesis team celebrating the journal’s launch. And now that the journal has been launched and the academic year is drawing to a close, it’s time to wrap up this blog for 2018. It’s been an interesting and rewarding year for Antithesis online. Through our weekly posts, we’ve explored representations of body diversity, Lisa Simpson’s feminist legacy, timeless stories of hope and heroics and why waterbeds should definitely be a thing again, among other original and thought-provoking content. We’ve shared old and new stories from the journal, bringing the past and present of Antithesis together each week. We hope that this is the start of a new era for Antithesis, one that’s connected to the academic past of the magazine but remains true to what the journal has turned into – an outlet for emerging creatives and academics to have their works published and to experience the editorial process. If you’re interested in joining the 2019 Antithesis committee, or submitting to the journal or blog, keep your eyes peeled on the website, and our social media. Finally, we’d like to extend a huge thank you to our contributors for providing wonderful content throughout the year, and the online editors for their hard and tireless work. It’s been a pleasure to work on Antithesis blog; we hope you stick around to see what’s in store next year. All photos taken by Sunni Midtskogen, 2018. Used with permission.